Ontario Coalition Against Wind Turbines Letter to MP Dean Allison | Mothers Against Wind Turbines Inc.
A coalition of several community groups West Lincoln Glanbrook Action Group (WLGAG), Wainfleet Ratepayers, and Mothers Against Wind Turbines Inc. (MAWTI) are jointly demanding enforcement of the Radiating Emitting Devices Act in regards to the siting and operations of 77 x 3MW Industrial Wind Turbines and seeking intervention over the issues of the approvals, permitting and placement of these turbines . Read the letter in its entirety below. 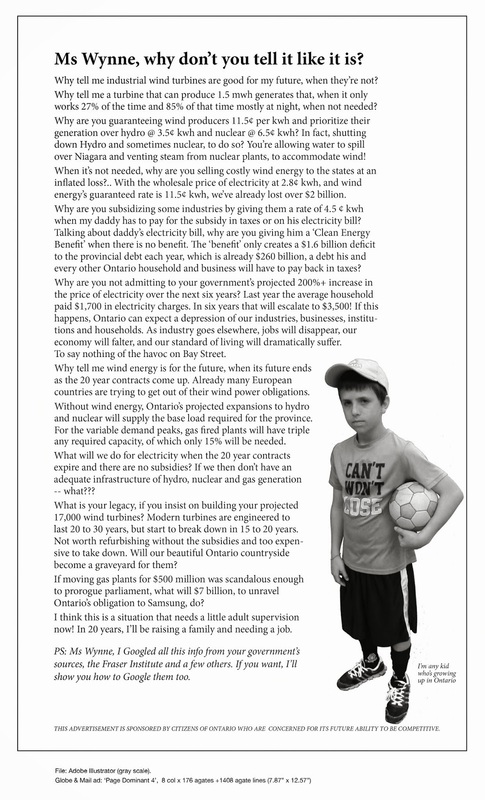 As executive officers of Mothers Against Wind Turbines Inc. (MAWTI), the West Lincoln Glanbrook Wind Action Group (WLGWAG) and the Wainfleet Ratepayers Association (WRA), we are writing to you at this time to seek your support in encouraging enforcement of the federal Radiation Emitting Devices Act. A number of our members met with you on July 28, 2015 and raised a number of issues regarding industrial wind turbine projects within your riding. We expressed concern with two particular issues and you indicated that you would follow up on them. First, we raised the issue of Health Canada’s requirement for a $5000.00 fee to be paid before the raw data from their study on wind turbine noise could be released. We have since been informed that researchers are prepared to pay the fee but are having some difficulty in sorting out which department holds which data and whether access to the “raw” data will be granted. Secondly, we asked that you intervene on our behalf with respect to Health Canada’s refusal to schedule a teleconference with members of our group to discuss what we believe is clearly a matter to be investigated under the Radiation Emitting Devices Act (REDA). To refresh your memory, we advised you of varying sound power levels associated with the wind turbines that are currently be erected in West Lincoln, Wainfleet and Haldimand. All other like turbines operating at various wind developments around the world show higher sound power levels than what was stated for this particular wind installation. That is clearly a matter for investigation under REDA. Health Canada’s approach to date has been dismissive and we were denied an opportunity to demonstrate and discuss our evidence via teleconference. They have clearly made the assumption that we have nothing worthwhile to present. These are to be the largest wind turbines erected in Ontario to date and given the evidence regarding the suspicious sound power levels, we expect better of Health Canada. between the noise (radiation) from wind turbines and effects on human health. We have several issues with the response from Minister Ambrose. First, there is no exemption in the REDA for wind turbines and Mr. David Michaud, Health Canada’s principal investigator has previously stated that wind turbine noise emissions do fall under the REDA. It is immaterial that there are no specific standards for wind turbines just as standards do not exist for other devices. The legislation still stands. The response also begs the question of why no standards have been developed. REDA includes authority to investigate complaints but the public has seen no evidence that the government has undertaken any action on complaints to date. As well, this randomized study, is not a substitution for investigations of individual complaints related to these products and their operation. The REDA includes authority to investigate complaints but the government has failed to act on complaints to date. As mentioned, we feel we can produce very specific evidence regarding the project currently under construction but have been denied opportunity to even speak with Health Canada officials about it. Furthermore, it is reprehensible to quote the Health Canada Wind Turbine Noise and Health Study as a justification for neglecting to investigate and enforce matters related to the REDA. The study is inconclusive and it has not been peer reviewed. As well, this randomized study, is not a substitution for an investigation. In our view, this is a dereliction of duty in terms of protecting the health of Canadians. Our three groups are writing to you today to request that you intervene on our behalf and demand that Health Canada perform their legislated duties. A number of your colleagues have already taken similar action in this regard. They are David Tilson (Dufferin-Caledon), Ben Lobb (Huron-Bruce) and Larry Miller (Bruce-Grey-Owen Sound). As our elected representative, it is our expectation that you will attend to this matter quickly. Please contact us if you would like further information. Thank you for your attention in this critical issue.